Starting a membership site is easier than you think. Although there are a lot of requirements involved, you can breeze through them all with this simple checklist. Once you get through this list you’ll be in prime position to launch your own membership site and start gathering a consistent monthly income from your site. Your first step is to get a domain name. Use the most popular keywords in your niche and add a community-oriented suffix like club, group or team. For example, your weight loss membership site could be hosted at www.loseweightclub.com. Your website design will have a big impact on how your members use your website and how often they come back. You’ll need a welcome page, a blog, a downloads page and perhaps a forum, depending on the nature of your membership site. If you want the best look for your membership site, consider hiring a professional designer who can give you a consistent look from start to finish. Your sales letter should convince visitors why they should join your membership site. Some would consider it to be the most important part of your site because it gets people in through the door. The sales letter needs to emphasize the benefits of your membership site as well as mentioning the features. Build desire to become part of the “in crowd” within the membership site and you’ll make the decision easy for them. 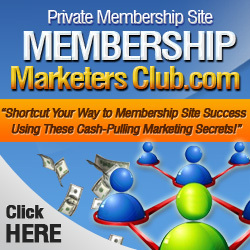 You won’t make any money with your membership site unless you have this set up properly. While many people use Paypal to process their monthly subscriptions, you can also use Clickbank, Paydotcom or Ejunkie to process payment. These three options are your best choices if you want to have an affiliate program for your membership site. A membership site script will keep your website secure. The script will build a registration form into your site, which will allow paying members to sign up and access the site. It will also keep visitors from accessing your content without paying. Thanks to membership site scripts you don’t have to hire a coder to set up a custom script for you. By following these steps, you’ll be ready to promote your membership site and start earning monthly income.